Sometimes life does not go the way you expect it to. Sports teaches us this lesson and it was on display yesterday in the game I was coaching with the Gr. 7 Boys Basketball team. We played hard but not all of our shots were dropping and it seemed like St. Mary’s could not miss. Shots that had no business going in found their way in anyway. It resulted in a defeat. But in defeat we can learn lessons about life. For the team, I reminded them to focus on what they could control. Their effort, their willingness to work hard, their positivity, their mindset, and their willingness to compete together. Often, we can focus on trying to change things out of our control and it wastes a lot of mental, physical, and emotional energy. Sometimes life seems to work against us and we need to be reminded in those moments to focus our energies on things we have control over. In doing that, we often find ways of moving forward. If you know of a family that is considering St. Jude School as a place for their child’s education, please share the application form with them or direct them to the school website or office. Click here to see the application form. St. Jude School is hosting it’s annual Open House starting at 1:00 pm on February 13, 2019. We encourage families to promote this Open House to all potential new families. St. Jude School is starting to field registration questions from interested new families. In order for us to know how many spots we have available we need to hear from our existing families that have children who will be entering kindergarten. Some families have already contacted Ms. Goh at the office with this information. We ask that if you have a child who will be entering Kindergarten in September 2019, please email Ms. Goh at office@stjude.ca. Please also include the child’s name and date of birth in the email. As an administrator it is my desire to always have school be in session. However, I cannot put students and staff at risk in the event that road conditions become treacherous. Our school is a commuter school in that the majority of our students are driven to the school and our staff comes from various neighbourhoods. This presents unique conditions for our school that must be considered when discerning whether to close the school due to weather. The school will communicate a closure due to weather through the school website and through email using our MailChimp service as well as Remind. Please understand that the decision to close is never an easy decision and numerous factors are taken into consideration. Parents are responsible for checking email and the website on cold weather days when snow is in the forecast. 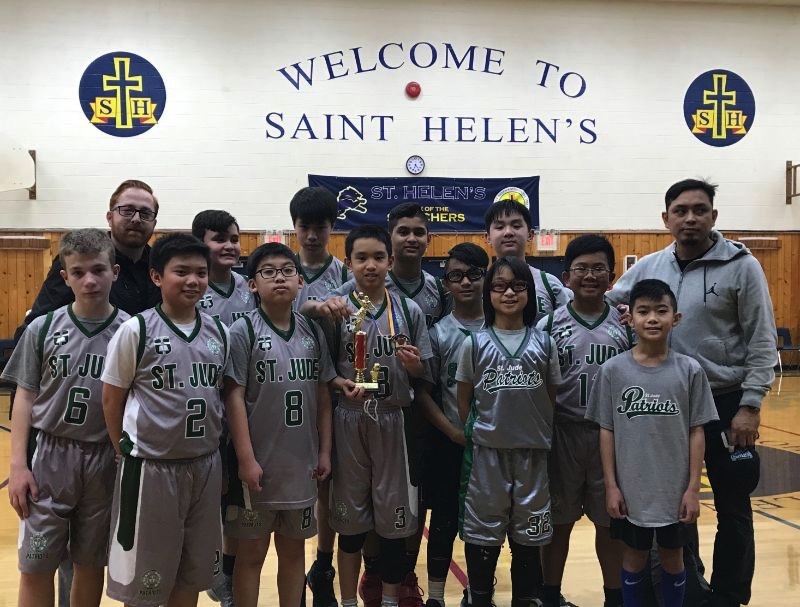 The Senior Boys Basketball team battled hard at the St. Helen’s Searchers Basketball Tournament on Monday, January 28. The team opened the competition by defeating St. Mary’s and then defeating the host school St. Helen’s and found themselves in the finals against a very good St. Catherine’s team. St. Catherine’s finished top 4 last year in Gr. 6 and our boys competed well against them. In the end we fell short but we were proud of their efforts. Vincent Velasquez was named a Tournament All Star for his outstanding performance. This week we had the BC Artifacts Mobile Museum in our school for two days. 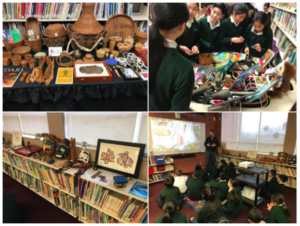 Students came to the library to listen to an engaging presentation by Tony Hardie and then they were able to interact with some of the artifacts. Among the highlights were the cedar weavings, the carved masks, a 200 year old musket, and the animal pelts. Some of the artifacts date back at least 12 000 years. The students came away with a deeper understanding of the importance of First Nations in our BC History. The school wishes to thank the PSG for helping to fund this important cultural and educational experience for the students. Thanks also goes out to Mrs. Collins for coordinating with the Mobile Museum. 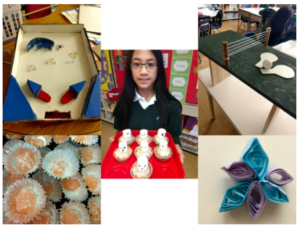 This past week the grade 6 students have been presenting their Genius Hour projects. What is Genius Hour? Genius Hour is a movement that allows students to explore their own passions and encourages creativity in the classroom. It provides students a choice in what they learn during a set period of time during school. For example, this week we have sampled a new reverse croissant recipe, Chocolate Swiss Roll, Muffins, Cupcakes, and even Turkish Delight! We have learned about the Great Pacific Garbage Patch, Moon-cakes, and how a pinhole camera works. We even played a working cardboard pinball machine! What an experience! 12pm Early Dismissal. Care Day. No Uniform.